Uniquely Crafted for a Variety of Audiences. 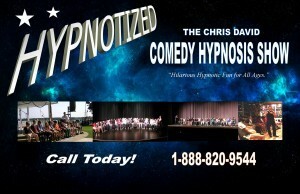 The Chris David Comedy Hypnosis Show is outstanding entertainment! Specially crafted, the show is fast-paced and hilarious. Your audience will be talking about it all year! It just got easier! Knowing you have a professional entertainer with experience will give you the ease and peace of mind for success. Chris has performed and produced professional theatre for over 15 years and offers dynamic entertainment for Fortune 500 Companies, Theatre audiences, Country Clubs, Service Clubs, Schools and Private Parties, with an emphasis on fun! Hypnosis is a relaxed and natural state of mind that each of us experiences everyday. Watching television, reading a book… daydreaming about our next vacation. When we become very relaxed and focused our mind settles into a natural and suggestible state called the Alpha State. 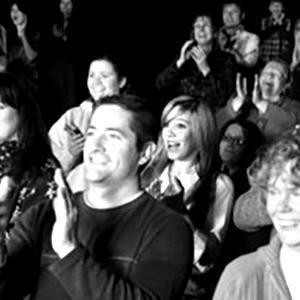 Stage Hypnosis is completely safe for everyone involved, including the audience and Chris is a trained professional with experience. He is a Certified Stage Hypnotist and is Safe On Stage Certified. For your comfort and safety, Chris carries a $2,000,000 liability insurance policy (he has never needed to use it, nor does he ever intend to.) This is professional entertainment you can rely on! Finding a show that will entertain your audience without embarrassing or offending anyone is important. Chris keeps his show clean and respectful knowing that great comedy is achieved by creating playful characters and humorous situations. Comedy Hypnosis is something everyone will enjoy. Shows like this will have your audience raving about your event for years! © 2015 copyright Chris Harder • All rights reserved.